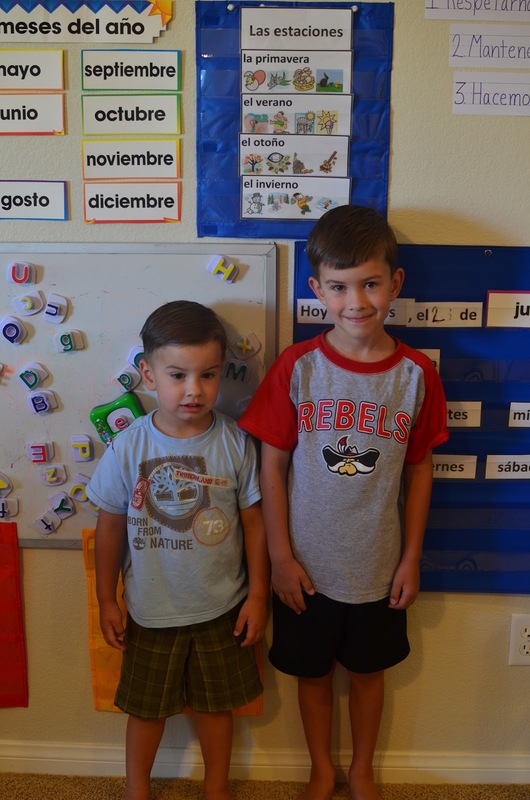 Homeschool Aventuras: First Day of School! 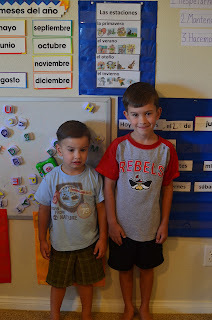 Today marked my son's first day of Kindergarten. Even though "sending" him off to Kindergarten meant we walked upstairs to our loft, it was still a bit of a sad day. It's tough to imagine this day as me actually dropping him off at a school. I feel so blessed that I am able to stay home with my boys and for this opportunity to do home education. I decided to start school on July 30th because we will have visitors for several weeks this semester and will probably take a family vacation at some point. Living in Vegas guarantees that we're never short of visitors, which is one of our favorite parts of living here. I also wanted to get started with our routine before Classical Conversations begins, so I'm not so overwhelmed all at once. Here are some pics of our classroom space. This area contains activities for my 3-yr old as well as extras if my 5-yr old finishes early. We're using a card table to do our work. I have big plans for dressing it up, but it's going to be a while before I can get to it. I finished the table top, but still need to paint the legs. I took maps, postcards, my old passport, etc. and glued them to the table. I used ModPodge to make a clear coating over the top. It's not my best craftwork ever, but it works! I left the map of the world, the US and Central America for the boys to use as reference when we're doing map work. Our Classroom Expectations, calendar, weather graph, pocket charts, etc. 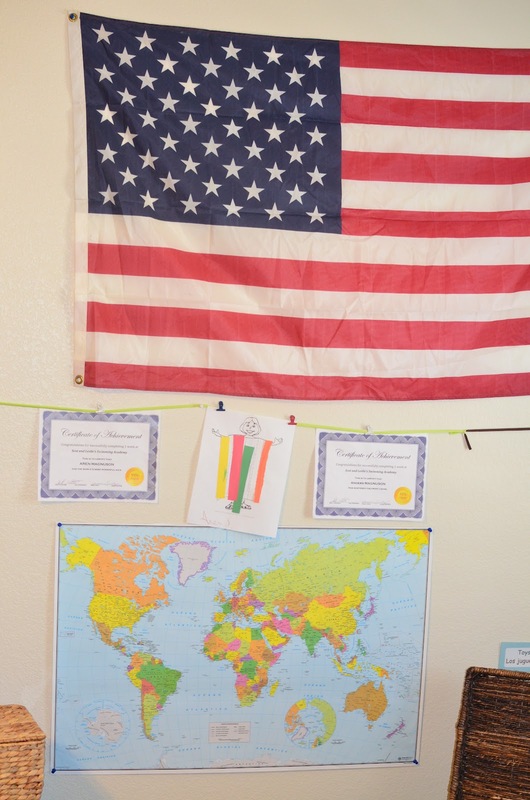 We have the flag up and say the Pledge of Allegiance every morning. Our World Map is in Spanish. 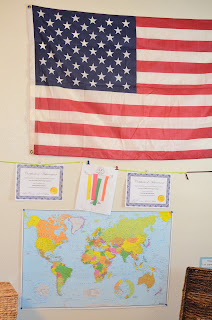 Between the map and flag is piece of ribbon I hung with thumb tacks for a place to hang the boys' work. Our classroom expectations: 1. We respect each other and our things. 2. We have a good attitude. 3. We do our best. I have to admit, I was really nervous about our first day, but also very excited. I felt like it went well, but already I wish there were more hours in the day. That can only get worse when Classical begins, but hopefully by then we will have our schedule a bit more refined.